It is quite rare for Michelin-starred heavyweights in Japan to set-up outposts overseas – perhaps born of an attachment to the amazing local bounty, an uncertainty of the foreigner’s palate or just a lack of desire to expand abroad. Luckily for us, in recent years this has started to change, and two high profile Japanese chefs are set to open up here in London – Mitsuhiro Araki of Araki and Yoshihiro Murata of Kikunoi. In Tokyo we sadly we couldn’t secure a reservation at Araki, but we did manage to eat at Kikunoi in Akasaka, the two-starred sister restaurant of the more celebrated original Kikunoi and Roan Kikunoi in Kyoto that hold five Michelin stars between them. 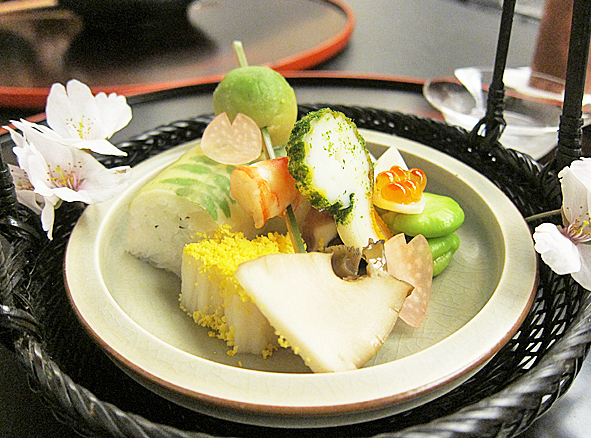 Murata’s style of modern kaiseki is an amalgamation of Imperial palace cuisine vegetarian Shojin fare, tea ceremony tradition and obanzai (Kyoto home cooking), and takes inspiration from the four seasons. His restaurants all serve the same seasonal menu, with three sets (of differing price points) on offer at dinner. Our ¥21,000 kaiseki kicked off with a complementary cup of sake and a petit dish of Sake-steamed Sea Bream Milt with Sea Cucumber Roe and Ponzu. Sea cucumber roe was completely new to me – rich and creamy, it paired well with the sharp ponzu and milky sea bream milt. A pretty assortment of appetizers swiftly followed – Tai (red sea bream) sushi with kinome (prickly ash leaf bud), grilled Squid with nori and egg yolk, Mountain Yam “butterflies”, Octopus, Yurine (lily bulb) petals, Udo stalk petals, Fava Beans, and a skewer of Abalone, Shrimp and Avocado. No standouts, but all pleasant. 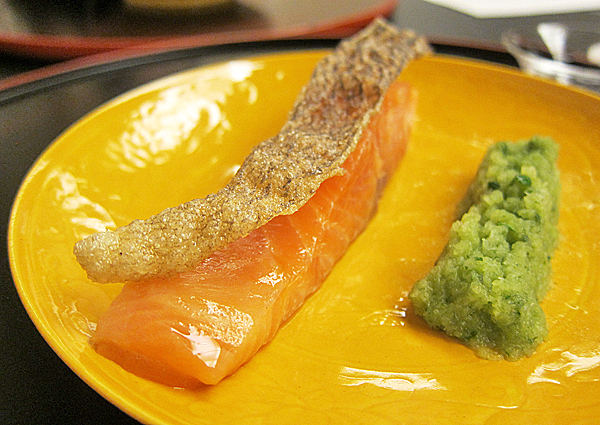 Sashimi of Kinmedai and Tai made more of an impression. 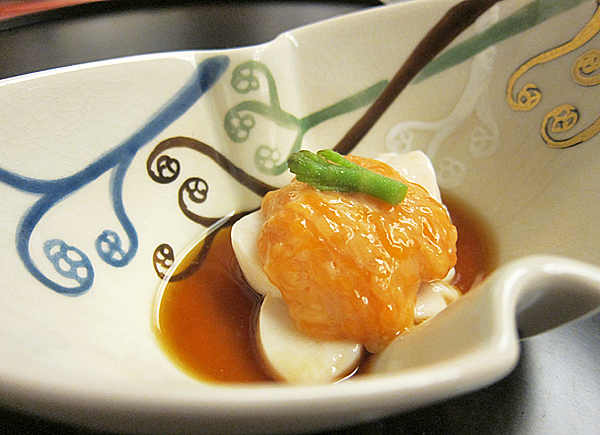 The skin of the red snapper was left intact and scorched, and the slices came sandwiched between thin slabs of ponzu jelly, the acid of which accented the fish perfectly. Translucent folds of sea bream were served with a rectangle of Suizenji Seaweed, that too was a great match for the milder fish. 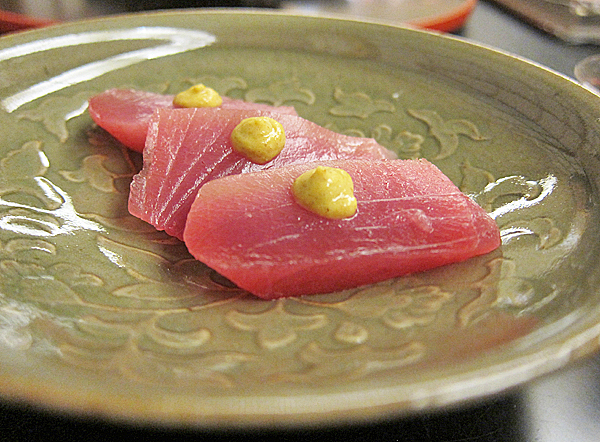 Another sashimi plate of Koshibi (young bluefin tuna) came dabbed with mustard and soy-marinated egg yolk sauce for dipping. Sounds unusual, but tasted great. Steamed Wakasa Tilefish, Cherry Leaf, Warabi Fern Heads, toasted Rice Cracker Dumpling and Ginger Juice boasted a multitude of components but each was subtle in flavour so came together harmoniously. 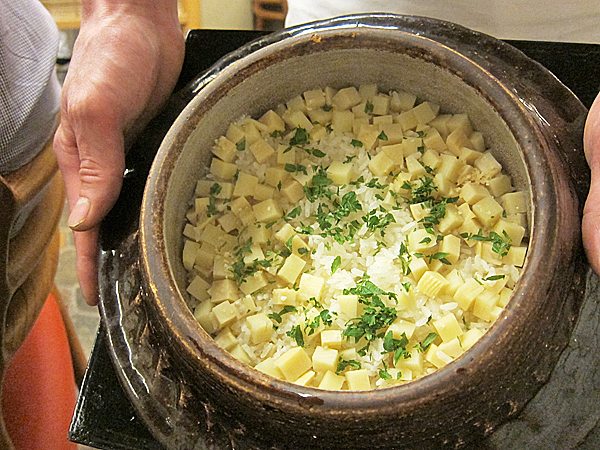 Takenoko (bamboo shoot) is abundant in Japan during springtime, so inevitably we saw a lot of that on the menu. 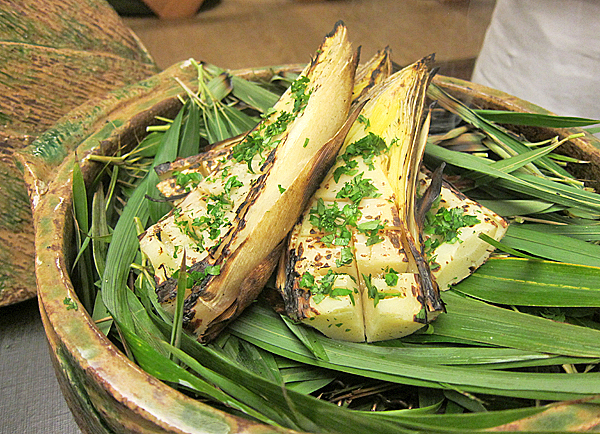 The first preparation of the vegetable was grilled with kinome miso – tender, not at all bitter, and wonderfully smoky from the char. Grilled Tasmania Salmon was cooked on such a low temperature that it ate like raw fish, the soft silky texture contrasted well with the crispy skin and grated radish seasoned with yet more kinome (which, like the bamboo shoot was also in season). 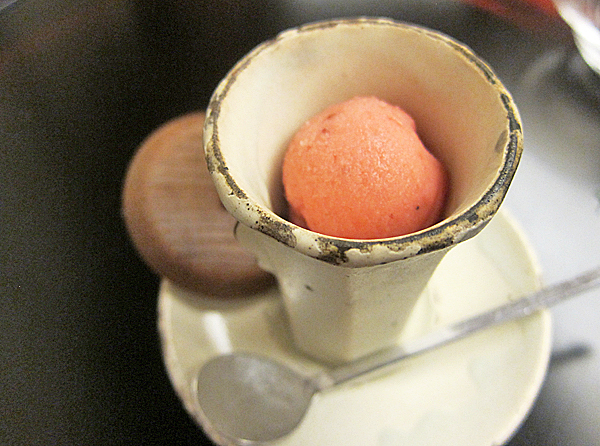 Strawberry and Wasabi Sorbet provided a sweet mid-meal interlude. There was a discernable bite from the wasabi, but only enough to make it intriguing. 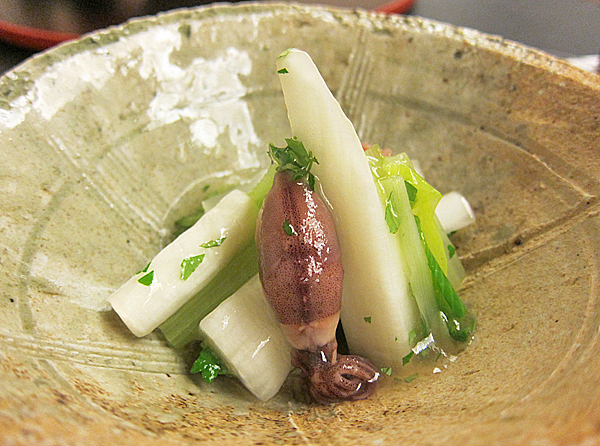 Vinegared Firefly Squid and Wild Mountain Vegetables was nice and refreshing. 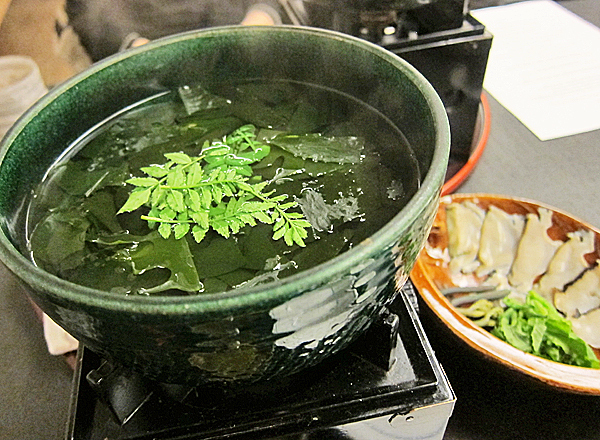 A do-it-yourself dish of Japanese Hot Pot with Abalone, Bamboo Shoot, Seaweed and Kinome was a steaming bowl of pure comfort. Steamed Rice with Bamboo Shoot, Green Pea Potage, Kinome, portioned out to us table-side was delicate and satisfying, but did pale in comparison to an outrageously good freshly-shaved black truffle-topped rice we had at Kadowaki a couple of days earlier. We were also beginning to tire of both bamboo shoot and kinome. To finish, a choice of desserts. 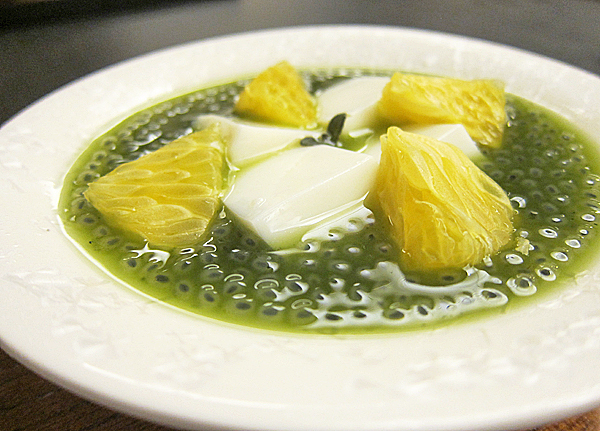 I went with the Almond Jelly, Hassaku Orange and Thai Basil Seeds, which was was light, clean and soothing. 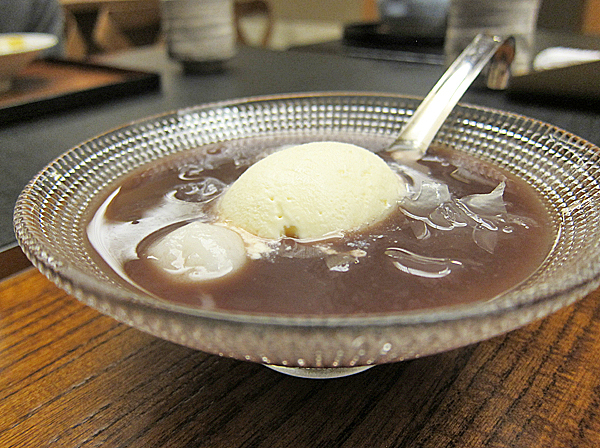 B liked his too – a chilled Sweet Bean Paste Soup with Rice Cake and Milk Ice Cream. 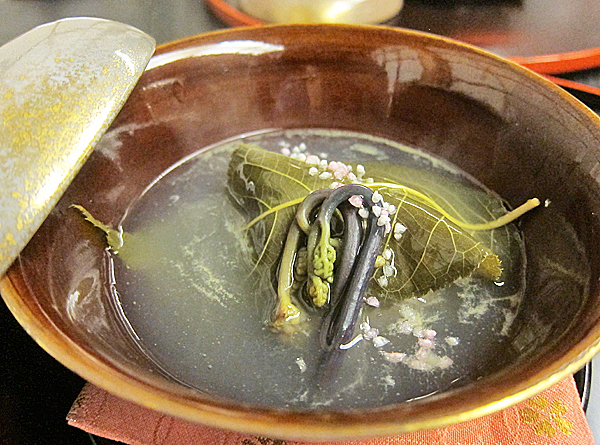 As tasting menus go, kaiseki is rather virtuous – the word after all refers to the practice of Buddhist monks holding warm stones to their stomachs to subdue hunger pangs – and despite being pretty full I felt sated, not ill. I enjoyed the food at Kikunoi (the cooking was certainly skilled and the ingredients top-notch), yet somehow overall it didn’t quite do it for me. It felt a little bit too commercial – from the waiters repeatedly bringing over the restaurant cookbook to the table for us to peruse, to the merchandise (including said book) for sale at the door. The menu itself also lacked range and wow-factor, although admittedly that could be down to the time of year we visited – their winter kaiseki looks pretty spectacular. Perhaps the more idyllic Kyoto flagship would have made a better experience, but this meal wasn’t really enough of a push for me to find out. ~ by gourmettraveller on July 24, 2012. I went about the same time as you… although being quite regular, i asked for the menu beforehand and did change a few of the courses. Kaiseki is really ‘eating the seasons’ although for us ‘visitors’ sometimes my experience tells me to go ‘with what you like’ or rather don’t force on something you might not like. My brother didn’t like Takenoko (bamboo shoot) and after several meals at other restaurants (which all served takenoko), he asked to change all takenoko courses at Kikunoi, while i kept mine. having said that, it can also be against the whole concept of Kaiseki – trying to change a few courses here and there and risk breaking the progression which Chef intended. I do enjoy takenoko, but I think I suffered from having already been in Tokyo a week and eating a lot of it elsewhere. 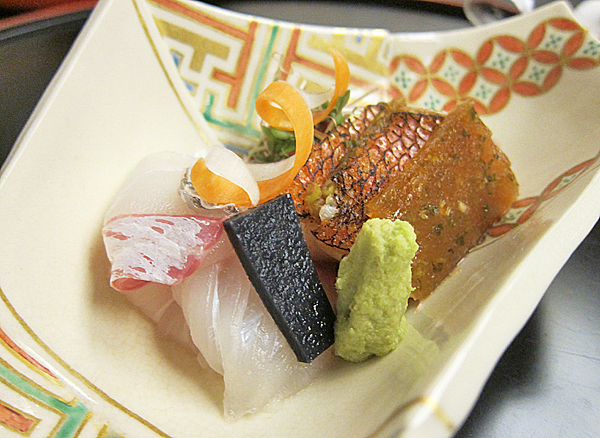 Like you said, it’s nice not to interfere with the kaiseki progression. I really must venture over to Japan some other time than Spring (I always get suckered in by those cherry blossoms!) to get a wider experience of kaiseki and Japanese cuisine in general, since most of it is so intrinsically linked to the seasons. I havent had time to blog on most recent visits, but maybe after visiting Kikunoi so many times, i’ve come to like other less well-known and more ‘pure’ cooking .. one is MATSUKAWA. Even less wow-factor , eg. rice course is just plain rice with condiments, but much more precision cooking. As for ARAKI, talked to chef extensively about this – he’s certainly not expecting to ‘recreate’ Araki there, he knows its impossible. Instead, he’s taking it as a challenge to use ‘lower-quality’ stuff (inevitably) but yet improvises on his ‘techniques’ such as age-ing, marinating etc… He said ‘it can be done’ … if anyone can, it’s surely Araki. For Kikunoi, I wouldnt hold too much hopes on it too. Nobody in the restaurant seems to have a role or even is in the loop of the project… I sense its more an entrepreneurial challenge for Murata-San… backed up by a middle-eastern Investor. I am MOST excited about Araki. Obviously it’ll be impossible how him to specialise in tuna like he does in Tokyo (would have been great to get over here though! ), but there is something special about taking “inferior” fish and working it in a non-intrusive manner to something special. Right now no one is doing anything like that over here except Sushi Tetsu. Kitcho Napa sounds very interesting! Napa would be a great fit for a project like that (produce-oriented).